Endless Summer blooms in my 2013 garden. it is only flowering from the new stems. MIDDLEFIELD, Conn. - Are your hydrangeas not blooming this summer? You're not alone. Old man winter is still wrecking havoc for Connecticut gardeners this summer. Last year's excessive cold, windy and lack of snow cover early on in Connecticut is to blame for the lack of hydrangea blossoms this summer, according to Chris Valley of Prides Corner Farms, Inc., a wholesale plant representative for Country Flower Farms. Most of the hydrangeas that are without flowers fall in the hydrangea macrophylla category, which bloom on old wood (think Nikko Blue and Endless Summer as well as other mophead or lacecap hydrangeas). This is a popular category of hydrangeas because they are the most colorful. "They put all their emphasis on creating flower buds in the fall that are then carried into winter," Valley said. "There is such a big time period when things can go wrong." Newer varieties like Endless Summer, Blushing Bride, Twist & Shout and Let's Dance have the ability to bloom on both old and new wood, which eliminates the danger of losing all flowers. 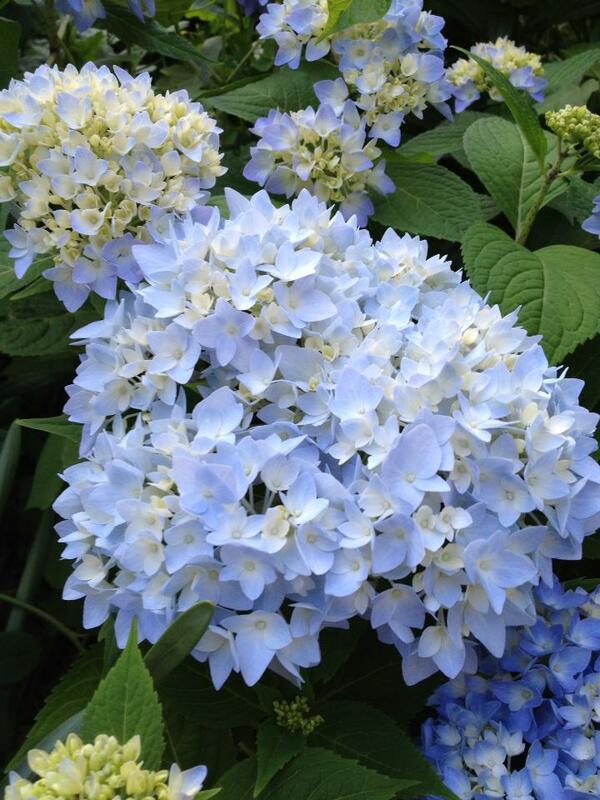 This year, however, the first wave of hydrangea flowers didn't occur for many of these varieties. At the end of August, these plants typically begin putting all their energy toward new growth. (If pruning is necessary, there is a three-week time window to do so.) To prevent loss of flower buds this winter, Valley has two suggestions. For a fairly large hydrangea, wrap the plant in burlap to protect it from the wind all winter long. (Take a string, tie it to a sturdy branch and walk around the plant to tie it up.) It's important to leave the top open. "Do not fill the burlap with leaves. Otherwise you will make a condo for mice," he said. If it snows - great. Snow is a good insulator for these plants. The burlap can be removed in the spring when the weather starts to be consistently mild. Don't wait too long in the spring to remove the burlap (example, the whole month of May) or the plant will go into shock. If there is a late frost advisory in spring, throw a blanket over it to protect the buds and leaves. The other option for care, which only applies to the Endless Summer category, is to cut the plant to 12 to 15 inches and cover it with leaves for winter protection. However, if you have a fairly large plant, or cringe at the thought of hacking your hydrangea to the ground, the wrapping in burlap option may be better for you. Valley has been with Prides Corner Farms for 15 years and said hydrangeas consume the biggest part of their catalog. "They are a super complicated category of plants," he said. The macrophylla category is one of five. For Endless Summer or Bloomstruck varieties, Valley recommends starting to prune when the plants start to flower. Cut long stems for bouquets to be brought indoors. "When you cut one flower off, the plant will send out two new flower shoots," he said. But for other macrophyllas, the time is now. "If pruning is necessary, this is the time to prune them," Valley said. "Pruning is not an essential thing to do every season. You have a three-week time window: basically the beginning of August to the end of August. After that, the plant's full attention goes to flower buds for the next year." Pruning will increase the amount of flowers for the upcoming season. "It is simple to thin it out. It's the healthy thing to do," he said. Thin the plant out by one third, including older branches in the middle. This will open up the inside of the plant for sunshine and air circulation, which will encourage growth. "Follow the stem down and trim it right out."